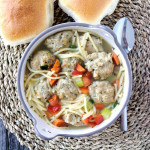 This Turkey Noodle Soup with Turkey Meatballs is an easy and delicious soup recipe! Serve with fresh buns for a cozy meal. In a bowl combine the ground turkey, parmesan cheese, onion, egg and spices. Form the turkey mixture into 1 inch balls and place them on a parchment lined baking sheet. Bake in a preheated 400 degree oven for 15 – 20 minutes, or until the inside of the meatball is no longer pink. When the meatballs are done baking, remove them from the oven and set aside. While the meatballs are baking, you can make the soup broth. In a soup pot combine the chicken stock and water and bring to a gentle boil, then reduce the heat. Add the carrots, celery, thyme, basil and salt & pepper. Simmer for about 10 minutes, until the carrots are tender. Add the cooked meatballs, noodles, red pepper and green onions and simmer uncovered for about 10 minutes. For the broth, I used a 1 L container of chicken stock, and 2 cups of water.